This WMTBOC is the outcome of all efforts made by the two main orienteering pioneers in Vicenza, Mario Dall'Amico and Dario Rappo, who have worked hard for the diffusion of this sport since 1978. 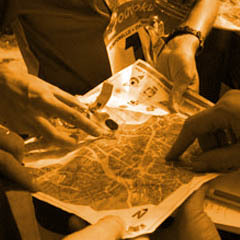 Local clubs affiliated to the Italian Orienteering Federation (FISO) are involved in the organization of the event: Misquilenses, Vicenza Orienteering Team, Orienteering Barbarano and Sphera Padua. MAURIZIO "MAURICE" ONGANIA. In the organising committe there are two Italian-Australians: beside Angelo Frighetto, there is, in fact, Maurizio "Maurice" Ongania, the delegate designated by the Italian Orienteering Federation. He is in charge of controlling all the technical aspects of the World Championship. Maurice was a national team orienteer in the '70s and '80s, when he did take part in six edition of the World Championships in foot-orienteering.